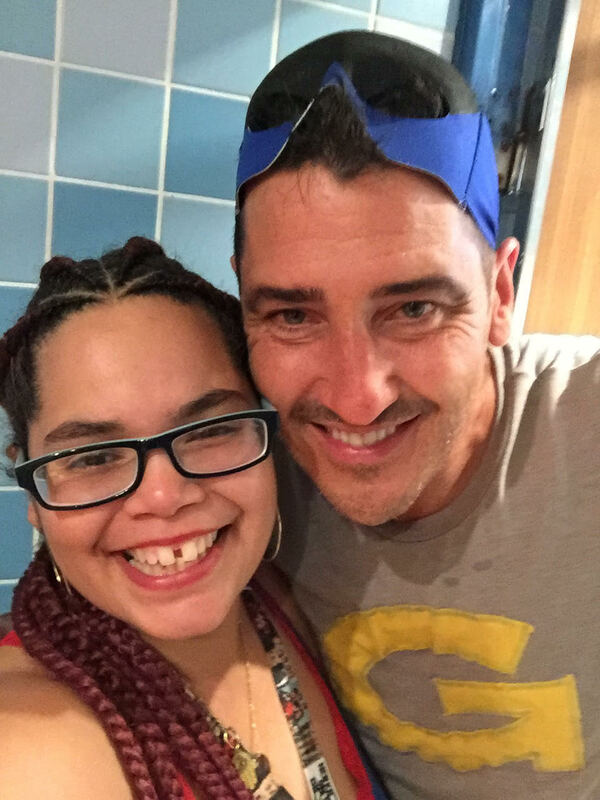 Join Brooke & Nikki as they start the NKOTB Cruise Countdown with two NKOTB Cruise 2017 stories from our friends Sonny (A cruise winner!) 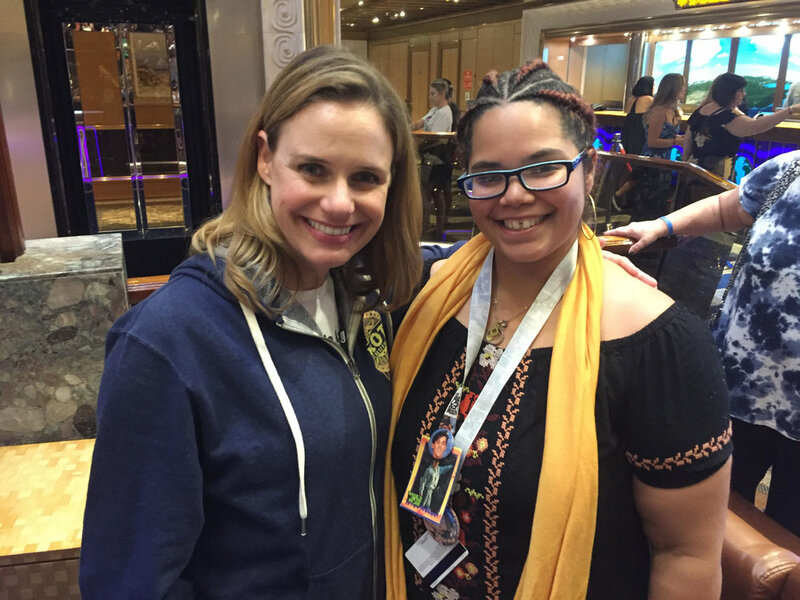 and Jessica (a cruise newbie). To say that I was happy to win the NKOTB cruise give-away would be putting it mildly. I have been a life long NKOTB fan, so when my husband told me that I won, I had so many mixed emotions that I cried and laughed at the same time. As a winner, I was invited to the NKOTB pre-cruise party at The Sugar Mill. The pre cruise party is a huge party open only to the cruisers. A band marches the NKOTB members into the party and then it kicks off. I had a chance to get a picture with Jordan and Danny. Getting through the lines at the gate was relatively simple and moved pretty smoothly. The excitement increased as the guys came into seating area where all the NKOTB crazed women were waiting to board the boat. It was everything that the cruise staff could do to keep the fans at bay. The themed parties were awesome. My husband and I didn’t know if we were going to be able to stay up for them because they started at 11pm and went till 3am. We are not party people, so we normally are in bed by 10pm, but once we got up there the energy of crowd was so amazing that it charged you up. We were able to last the whole night and even attended an after hour party where Donnie was. Group pictures moved really fast because they gave you about 2 seconds with each guy, which is long enough to give them a hug and an awkward smile before they pushed you through the door. The concert was a great addition to the cruise and Joe even did karaoke for about 3 hours due to the rain cancelling out the deck concert. He is truly a performer and a very funny guy. I was able to get a group selfie with the guys on the last day, which was awesome. 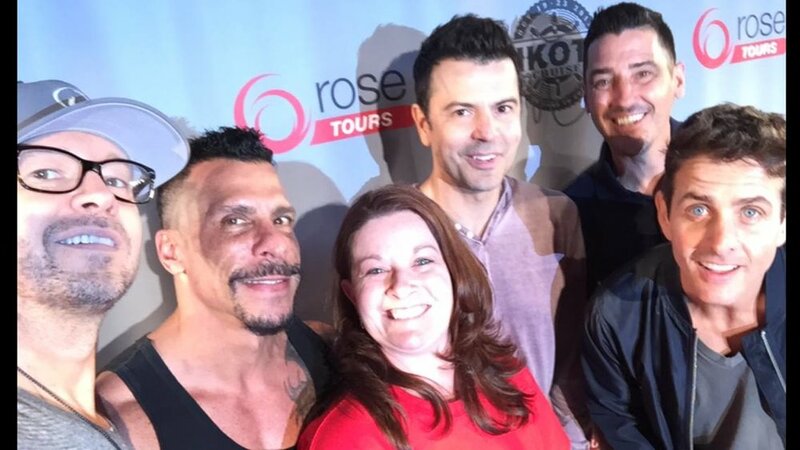 There’s nothing like getting a selfie with your favorite band with Donnie taking the picture. A few more hugs and I was rushed out of the room. I wish I would have had a little more time to at least say something more meaningful other than hi. Overall, we had a great time. This was our first NKOTB cruise, so we didn’t know what to expect. We scoured the Internet for information from other cruisers. We were a little scared because of the horror stories out there of fights and people peeing on the deck, so they didn’t lose their spots. We didn’t see anything of that and everyone was nice and friendly. You definitely get enough NKOTB time, from concerts, game shows, pictures, and themed nights. The whole time on the cruise my husband and I said that it was a once in a lifetime time event and that we wouldn’t do it again. By the time we made the 12-hour drive home we were convinced that we would be attending cruise number 10 next year. Hello, My name is Jessica and I am 33yrs old from NYC. I've been a NKOTB Fan since I was 7-8 years old and now have a 7 year old daughter who is second generation blockhead aka Joey Girl. 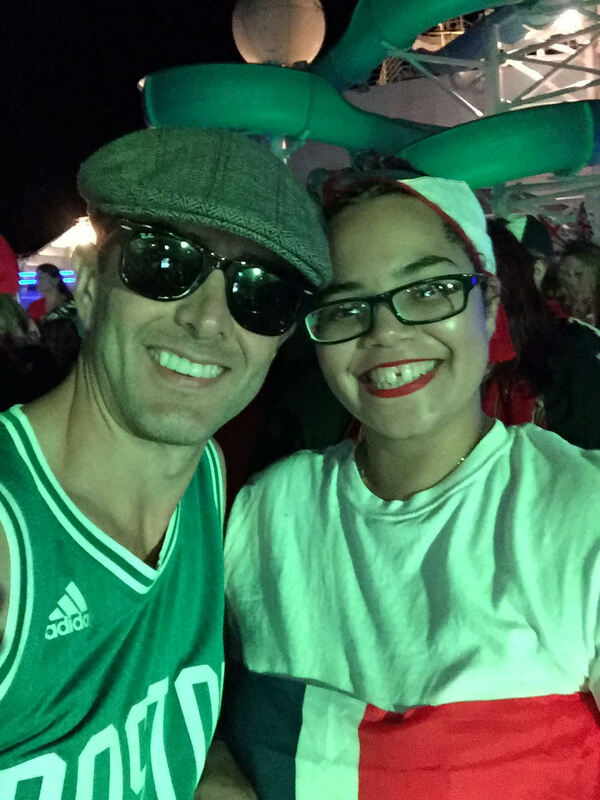 Well this was my first time ever attending anything NKOTB and ever meeting them , so when I got the opportunity to get on this boat I made sure to enjoy every single minute of it. My day started on October 18 at 7 am after dropping my daughter off at school I made my way to LaGuardia Airport I arrived 3 hours ahead of time so I decided to kill sometime and proceeded to walk around the terminal and met a few blockheads waiting to fly down to New orleans as well which was an amazing opportunity to meet new friends. Well I board my flight and get to Chicago where I have to wait another 3 hours to board my connecting flight to my final stop NOLA!! Finally i arrive in Nola and to my surprise I meet a former Rock This Boat cast member Kayla from season 2. She is the sweetest person ever . I told her this is my first crusie and she told me to enjoy myself and make sure to take selfies with the guys lol especially Jon( I was wearing a Jon T-shirt ) . I made my way to meet my new roommates in The French Market Inn and went to get some liquor ( why not We are on vacation mode). The following morning IT'S CRUISE DAY!!!! We make our way to the port and around 11:30-11:45am The guys arrive and mayhem begins !! 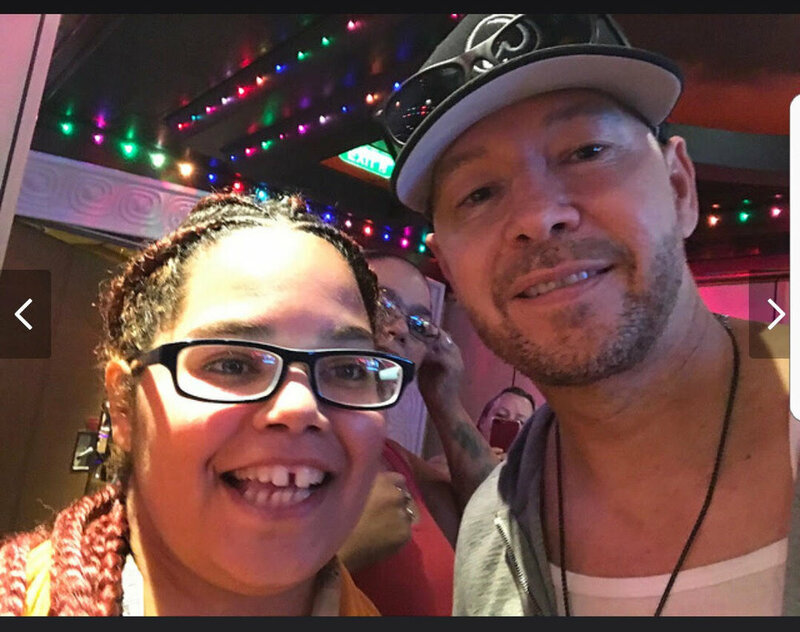 They all make their way and take selfies and Donnie jumps on a couple of seats and starts chanting we are going to have the time of our lives..
As we are boarding I burst into tears because as said before this is my first time meeting them and just thinking I will be on a ship withthem for 4 days and rub elbows with them is too much for me to swallow. Well we get in the ship and make our way to the cabin and get ready for the Sail Away party ! This year we had a new oath in which it mentioned Spreading Love on this boat and everywhere we go" Our new theme song was Titanium by David Getta and Sia. The guys looked amazing in their suits and they walked around the Lido deck taking selfies and hugging their fans. The most epic night in my eyes . I met him as I was running into the bathroom after having a few drinks ( didnt notice I had ran into the mens room until I had slammed the door on his face from shock) lol EPIC I KNOW!! The line went pretty fast and in order was Danny, Donnie , Jordan, Joey and Jon!! I once again managed to get a small conversation with Jon and totally mumbled like a school girl lol but he was so sweet about it. It was pretty epic night in which Joey had jumped into the Lido pool with a couple of fans and Donnie danced on top of the tables in the bar . ( yes I know those marshmallows in your face is everything !! Donnie and Jon closed the night by thanking the BH Family for all the love and support we have shown them for 25 plus years! And OCT 18-22,2018 Cruise #10 will happen and will be leaving Miami and heading to Half Moon Cay and Nassau!! So Let the countdown begin!!! Party continued until 6:30 am ! !